The Air Force is poised to improve warfighter success rates in long-term conflicts with new wargaming technology developed by a small business partner. With support from the Air Force Small Business Innovation Research/Small Business Technology Transfer Program, Ohio-based Frontier Technology Inc. produced a modeling and simulation capability to allow military operations planners to more realistically assess potential maintenance and logistics situations in combat. 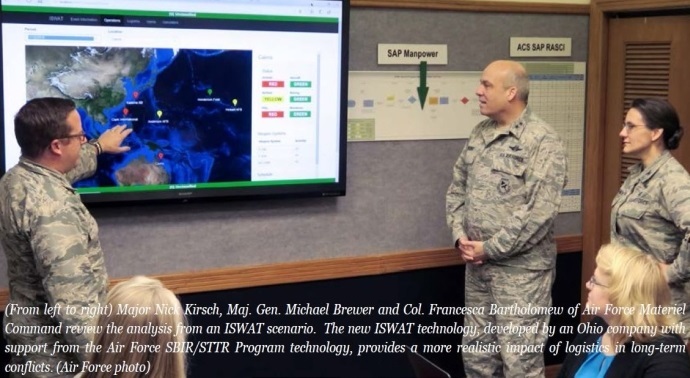 Also known as ISWAT – for Integrated Sustainment Wargaming Analysis Toolkit – this analytical model addresses the overall impact of sustainment systems on the Air Force’s ability to conduct protracted operations. Frontier Technology matured ISWAT with additional support from the Air Force SBIR/STTR Commercialization Readiness Program and the Air Force Rapid Innovation Fund so it could be used by Air Force Materiel Command. The Air Force and other services routinely conduct wargames to test the ability of their people and processes to handle conflict. Without risking lives and aircraft, these exercises allow planners to find and correct deficiencies. Prior to ISWAT, sustainment modeling and simulation during wargames typically consisted of senior military leaders relying on spreadsheets and professional judgment. This new technology will improve accuracy, and as a result improve success rates in the field. There has been a lack of significant research and development investment in wargaming technology in recent years. As a result, the growing “reality gap” has fostered an unrealistic expectation for weapons systems in modern combat simulations. ISWAT has received significant interest within logistics and wargaming communities by addressing that critical shortfall. The Air Force SBIR/STTR project enabled Frontier Technology to perform detailed modeling of sustainment support for weapons systems. This included the frequency and duration of tasks and resources, as well as their impact on metrics such as sortie generation rate, availability, and mission capable rate. For example, the new ISWAT technology can track and calculate engine time on a wing as a function of flown sorties. This allows for the possibility that the aircraft might not be able to fly the next mission because of maintenance needs. Previously, aircraft were only removed from simulations if destroyed in combat. Because of its success, the company has logged millions of dollars in Phase III contracts to support the Air Force, according to Todd Henrich, vice president, strategic product planning at Frontier Technology. The company has also been exposed to potential new customers from other services as well as partner nations that conduct wargames. Phase III contracts – funding from sources outside of the Air Force SBIR/STTR Program – are a sign of commercialization success. This type of commercialization is critical because it ultimately helps drive down technology costs, bring new technology to the warfighter and stimulate the economy through small business growth.